Tempera on linen mounted on Masonite, 36 x 48 in. EXHIBITED: Lawrence Technological University, Southfield, Michigan, April 2011, Selections from the Collection of Mr. and Mrs. A. Alfred Taubman, illus. While the favored American term is carousel, these rides are generally called merry-go-rounds in Europe. The distinction is, by definition, that merry-go-rounds rotate clockwise, while carousels go counter-clockwise, a distinction long been ignored in American usage. Thus, Marsh’s amusement park ride is, indeed, a merry-go-round. Marsh was fascinated by these mechanical wonders, theatrical extravaganzas that employed color, motion, light, and sound to create participatory spectacle. For Marsh, they offered irresistible opportunity to paint both riders and horses against a fantastical setting. Marsh was a devoted student of anatomy who not only studied academic textbooks, but enrolled in dissection classes at New York Hospital/Cornell Medical School. His concerns, however, were obviously not clinical. Marsh’s view of the inhabitants of the city is inescapably sexualized. This is particularly true for his visions of females, and the young women riding the Merry-Go-Round prove the rule. 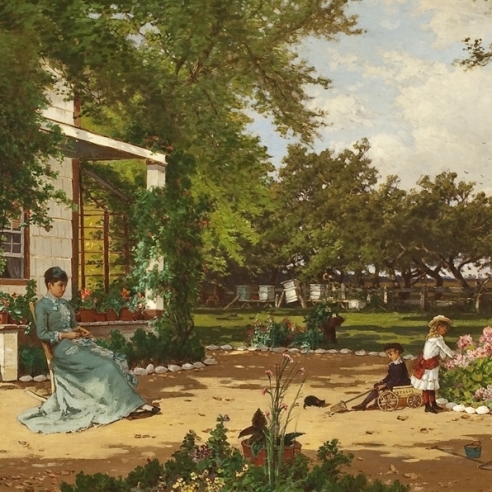 The two women seated on their carousel mounts are familiar denizens of Marsh’s world. A male rider stares intently at one of the women while a fourth rider is just visible in the background. The human figures here, though, play second fiddle to the carousel horses, the true focus of Marsh’s attention. Merry-Go-Round offers a snapshot view of a magnificent team of wooden horses, eternally racing one another in a never-ending circle. 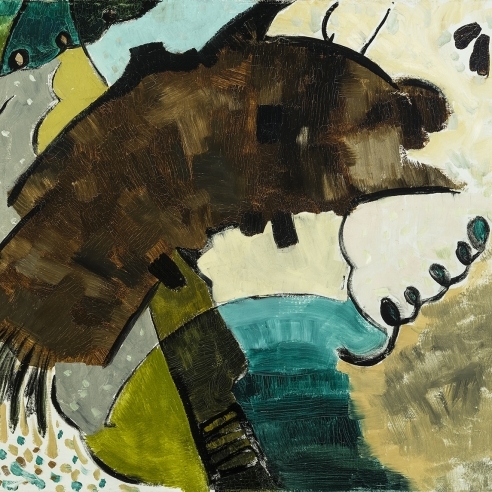 Marsh’s composition reads as a swirling cacophony of equine heads and hooves punctuated by human figures. 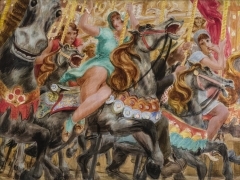 Marsh’s sketch books contain at least one page that appears preparatory for Merry-Go-Round, a sheet of multiple views of horses (Edward Laning, The Sketchbooks of Reginald Marsh [Greenwich, Connecticut: New York Graphic Society, Ltd., 1973], p. 77 illus.). Marsh’s depiction of the carousel horses are as distinctively New York creatures as their human riders. Coney Island was historically a center for carousels, with twenty-five different ones documented at various times since the late 19th century. These are classic Coney Island horses, differentiated from the county fair style, which was relatively simple for ease of assembly and disassembly as it moved around the country, and the Philadelphia style, which aimed to be more lifelike. These imposing equines were hand carved by a generation of European craftsmen who passed through the Brooklyn workshop of German-born Charles Looff before striking out on their own. Coney Island style horses are described in the literature as “flamboyant, aggressive-looking—neck straining, nostrils flaring” steeds “with explosive flying manes and powerful straining bodies.” They are characterized by “virtuoso feats of carving” often “bedecked with jewels and gold and silver leaf.” The credit for perfecting the style is commonly given to Marcus Illions, “the Michelangelo of carousel carvers” (Martha Schwendener, “Sacred Skills Thrive on a Merry-Go-Round,” The New York Times, October 5, 2007, p. E42). Charles Carmel was another carver who worked in the style. Illions and Carmel horses can still be found on the one remaining carousel in Coney Island and on the carousels at the fairgrounds in Flushing, Queens, and Carmel’s carousel in Prospect Park, Brooklyn, relocated from Coney Island. Reginald Marsh clearly relished these works of art. 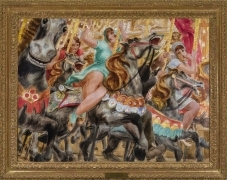 The horse on the far left in particular, with no visible rider, appears to bear down on the viewer, about to leap off the canvas.